Square-rigged ships are a passion for Lindsey. He has sailed or stepped aboard most of those in Southern California and longs for a trick at sea on a full-rigged ship. 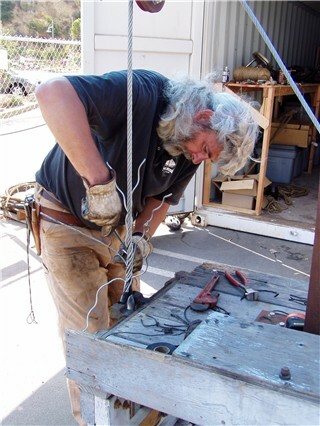 Meanwhile he is satisfied to hone his skills in such trades as wire-rope splicing, wire seizing, tuning the rig and making and replacing all types of standing and running rigging. He is called on frequently by expert riggers to demonstrate and perform splicing of core-to-core low-stretch lines, Brummel splices in Spectra and Kevlar lines, and standard double- and single-braid splicing.